This year continues to see a massive demand for Fire doors. Recent council reviews of buildings has highlighted areas to landlords where Fire doors are needed due to a tightening of legislation. Fire doors are a specialist product that can often result in long lead times and specialist installers. Commercial Door Services supply and install Fire doors in the Rotherham and Yorkshire area. We can supply Fire doors in a wide variety of styles and including glazed versions with fire proof pyro glass. For more information about our Fire doors in the Rotherham area call 07838159008 or 01302 817883. Happy Yorkshire Day from Commercial Door Services. For more information about our roller door services in the Doncaster area call 07838159008 or 01302 817883. Our installation team are fully trained, fully qualified and fully equipped to tackle any roller door installation! As shown with this image, of a installation of a oversized door at a rail depo in Doncaster. In addition Commercial Doors Services realise the importance of Health and safety, not only for our customers but also our workforce. We are committed to safe working practises and safe working environments on all projects that we undertake. For more information about our roller door Installs in the Doncaster area call 07838159008 or 01302 817883. Rotherham has seen a lot of investment come into the Town the last few years. With that has seen many new retail and business parks spring up, and with business parks comes roller doors! Commercial Door Services Ltd are a local company based in Doncaster, however operate around the surrounding Towns and Cities. In fact we have a dedicated team operating in Rotherham and Sheffield as we have many commercial and retail customers in the area. Not only do we supply and install a wide range of roller doors and shutters we also offer a first class maintenance and repair service. We have been around long enough to understand what a commercial customer expects……a timely response and a timely solution! For more information about our roller doors in the Rotherham area call 07838159008 or 01302 817883. If you are a small business…..or large business in fact! Based in Doncaster and are operating from a unit or warehouse, a roller door will be an important investment. You probably have not thought about a roller door been of much importance to your business. However when you think about it…..you need it to be strong, secure, reliable and easy to operate. If you are a busy business, the last thing you want is to be worrying about is a door! Commercial Door Services supply, install and can maintain a wide variety of Roller doors. We can accommodate any business and offer a Roller door solution tailored specifically to your needs! For more information about our Roller Doors in the Doncaster area call 07838159008 or 01302 817883. A number of business owners in Rotherham, now have automatic roller doors installed. There are times when these automatic doors break down. Which is always very inconvenient as it is usually when a business is opening or when it is closing! Some older roller door types do not have a function to switch the door to manually, often leaving the operator of the door in a state of panic! Commercial Door Services have been called out to just about every automatic door problem in the South Yorkshire area…………..and repaired just about every problem. Commercial Door Services can repair most automatic door problems on the first site visit. However at the very least we will provide a solution there and then to either secure the door or enable a door to be opened. For more information about our automatic roller doors in the Rotherham area call 07838159008 or 01302 817883. The team at Commercial Door Services like everyone will be cheering England on! This could it be our year……….. However any Door emergencies and we will be on call! For more information about our door services in the Doncaster area call 07838159008 or 01302 817883. 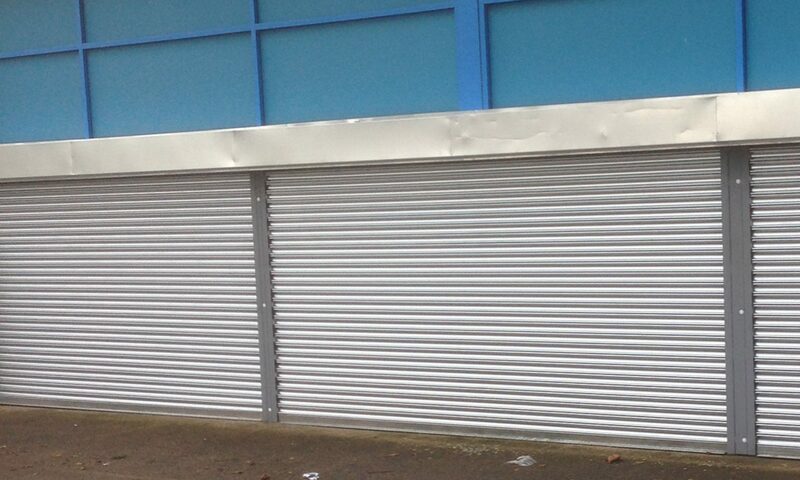 Many new retail premises are built with automatic roller shutters. Automatic shutters are a much better option to tradition pull shutters. They are a lot more user friendly, especial on the cold winter mornings when you are trying to prise a frozen shutter open. With a Automatic system you can operate the opening and closing from inside. They are also more reliable, and in the event of a power problem, the shutters come with a manual override! All automatic shutters and doors can be retro fitted, so it is not just new building, but man existing properties are making the switch. For more information on New Automatic Shutters outs call 07838159008 or 01302 817883. More and more of commercial and industrial units have automatic door systems. There are many different designs available, such as sectional overhead and many different ways theses are operated. Such as on a keypad entry or some with a fob or key. What they all have in common though is that when they go wrong it can cause a business owner major problems. Commercial Door Services specialise in automatic door services, from the supply and installation to the repair and maintenance. With our fully stocked van we can find a solutions to most automatic door problems on our first visit! For more information on Automatic Door Services Doncaster outs call 07838159008 or 01302 817883.